Welcome back to part 2 of my 3 part series of ‘Why YouTubers Need to Start Thinking like a Blogger’ if you haven’t read part one yet, then it’s best to go back and read it and then come back to this one after. So, now that we have covered the social media side of things, it’s time to go through money making tips. I’ve heard a lot of big YouTubers and smaller YouTubers alike complain about the big YouTube Apocolypse and how it’s harder to make money now, but really and truly unless you were a big YouTuber, I am assuming that was not a big commision you were making and actually if certain YouTubers hadn’t broken the rules or used the platform to spread hate messages and rip off other peoples work to cheat the system, then YouTube wouldn’t have lost some of its advertisers and wouldn’t have been forced to review its terms and conditions. Ok, so instead of being able to monetise your content straight away you need to get 10,000-lifetime views which is roughly £7.75/$10.00 in total not very much on the grand scale of things. If you actually think about it 10,000-lifetime views are not that hard to get if you promote you vlogs and channels, with the suggestions that I have given you on part 1 and release content consistently. Even when you get to 10,000 views your content stands a chance of being demonetised if you break the terms and conditions in some way and actually YouTube don’t really want to do this because for every channel that is not monetised means they are also losing advertising revenue and whilst you are losing a little they are losing a lot more than you are. In my personal opinion, I think that YouTube changing it’s terms and conditions is actually a good thing because it means that small YouTubers like myself can work on making great content and building a supportive audience whilst doing what we enjoy we are doing without thinking of the money straight away and bigger YouTubers can focus on getting back to releasing content for their viewers and not for the money (although they are still making the money. But honestly, this just means that YouTubers will have to work on releasing quality content from here on and it will mean you as a content creator will need to start also thinking like a brand. So this is the part where I explain why you need to start thinking like a blogger, some bloggers actually make a decent living through their blogs and this is because they are brand-friendly they work with PR Companies on behalf of brands, they use affiliate links and some even sell their own merchandise. If you took my advice and got a website you can write blog posts to accompany your Vlog and include the affiliate links to a brief description and add images. Also, some companies, have their own affiliate marketing (I will link some below that I know of), but this will also mean that when someone visits your site if they click on one of your affiliate links and make a purchase you could make some money from this. Top Tip: Make sure you have a disclaimer in your post so that your viewer or reader understands that by clicking your link you will earn a small percentage but the price is still the same as it would be normally, it’s just that by clicking on your link they are helping you). It used to be that celebrities would be the number one choice to work with brands but now studies show that Bloggers and Vloggers are more trusted and potentially have a bigger reach, so more and more brands want to work with influencers. There are lots of ways that a blogger or vlogger can work with brands, for instance, Travel Influencers work hotels, tourism boards, travel companies, and airlines just to name a few, whilst Fashion Influencers work with clothing brands and stores, Beauty Influencers hair and makeup brands, Fitness influencers work with fitness brands equipment and clothing to protein shakes just to give you an idea of how influencers are able to work with brands. But do not wait for the opportunity to come and get you, you need to find them go to your niche trade shows and exhibitions, get in contact with PR companies or the marketing teams who represent the brands and locations you want to vlog about, send out your media kit (I will talk about this in part three) approach them with your idea for a collaboration but don’t make it all about how it will benefit you, you need to show how you work with them will be beneficial for them (basically market yourself and your brand if you can offer yourself as a blogger, YouTuber, Instagrammer and marketing genius the more work you will get). 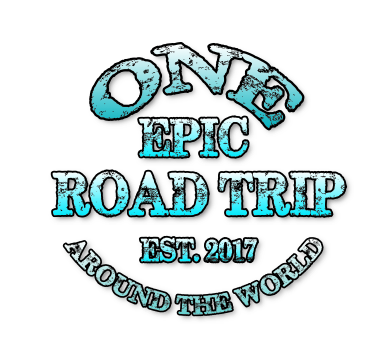 This is a lot easier for a Travel influencers I guess, but contact press departments and see if you can get on a press trip or even contact venues like a theme park or restaurant with an idea for a collaboration if you are just starting out you probably won’t earn money from this but a few free press trips that you have a well-written blog or filmed a great vlog will get you on the PR or marketing teams radar. Contact companies that you are passionate about or companies who stock products which are with your niche and in exchange for reviewing the product you can get free products which you can either save yourself some money on or host a competition or even sell the product afterwards. At present, I am not a brand ambassador, but I will look into it as part of my trip. But if you partner with a brand as an ambassador this means that you endorse the product, so make sure that you believe the product is amazing as your reputation is everything. But being a brand ambassador can sometimes be paid or mean a lot of freebies. You don’t have to be a popular influencer to start thinking about making money from your brand you can set up a mini shop and if your followers wanna support you, what they can do it by purchase your products rather then you asking for a free hand out, set up a sellers account with a printing company, there are plenty out there. Promote your products by wearing the wearable items in your vlog. If you are a travel blogger or vlogger or have a decent camera and you are handy with photoshop, there is no reason why you can’t sell your images on canvases or even sell the images to shuttle stock or dreams times to make that extra cash. There is probably lots of footage that haven’t used and is just gathering dust, why not licence your unused footage on places like video blocks, Dreamstime and Shutterstock this way you can make money from the footage you may never use. If you are a good enough video editor why not offer your services to other YouTubers or even find work for editors on freelancing websites, but first build a portfolio up before offering this service. 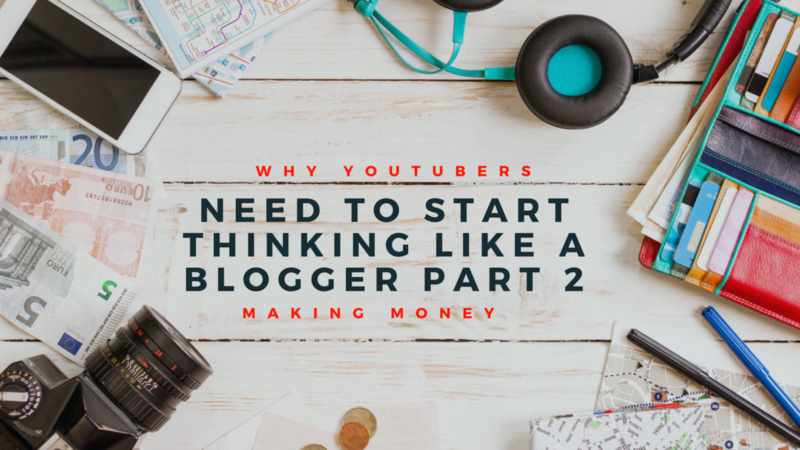 There are many other ways to make money but that brings us to the end of “Why YouTubers Need To Start Thinking Like A Blogger Part 2”, I hope that you have found this helpful and I would love to hear some other ideas on how influencers can make money. Thank you for reading and please sign up for the newsletter to stay up to date with my posts. Great advice! I don’t vlog just yet but I do intend to start so it was good to know ways to apply my blogging knowledge to the vlogs! You tube is such an under appreciated medium, I’d love to give it a go in the future, once I’ve got my blogging skills into touch. Thank you for sharing, some great ideas! This article is an invaluable read for me as I am a blogger who is going to start a utube channel in the new year and its interesting how you are advising your vloggers to think more like a blogger with regard to quality content. I’ve just bookmarked this. Great! I have a YouTube channel but I am not at all regular in posting. Vlogging is big these days and your tips are really on point! I do have plans to focus on videos in 2018 and I can definitely use some of your tips. This is great for me a lot of helpful advice as I am starting my vlog next year, very exciting times.